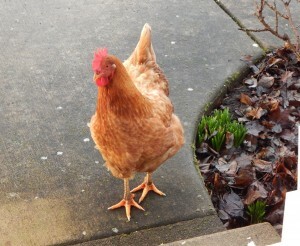 May you rest in peace my dearest hen. I never gave you a name, but you were my favorite. You reminded me of my mother because you were always so interested in what I was doing in my garden. Whether I was outside walking around with a cup of coffee in my hand, or crouched down digging in the dirt, you would always come and check me out and talk to me. I should have named you Curiosity. You had such a calm disposition and an intelligence about you that made you seem almost human to me. Until you, I really didn’t have any excessive fondness for any of my hens. You showed me that it was actually possible to feel deep affection for a chicken. You were a sweetie, and I will miss you. I don’t know why my New Hampshire died. She was just fine the day before and when I found her she had just keeled over and still had straw in her mouth. Maybe it was a heart attack. In any case, sometimes there are no clues. Here is a poem I found by a man named Jack Prelutsky that is a sweet chicken poem. One of these days I will try to write one myself.